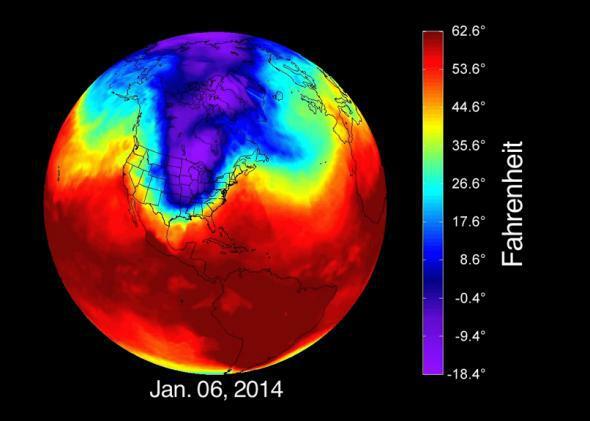 NASA offers mind-bending visualization of the January polar vortex. Cold air from the abnormally elongated polar vortex as it appeared in early January, stretching from Siberia to the Deep South of the U.S.
Just when you might have been slowly emerging from the hibernatory winter fetal position, NASA has brought all of us back to that dark scary place by releasing a mind-bending visualization of last month’s epic “polar vortex” cold snap. What Fetzer doesn’t mention is, despite what seemed like a month of brutal Arctic punishment, January 2014 ended up almost exactly average, temperature-wise, for the continental United States. Yes, there were many more daily cold temperature records set nationwide than warm ones last month, but that’s largely a result of there being more thermometers in densely populated areas out East. The magnitude of unseasonable warmth in California and the West has easily trumped the cold-ness of the East’s polar vortex, in effect averaging out the nation’s temperature. But simple averages can mask extreme weather: Alaska’s Port Alsworth hit a stunning 62 degrees Fahrenheit on Jan. 27, the warmest temperature ever measured statewide during the month of January, according to National Weather Service records.